Last month we discussed the connection between the neck and shoulders. I described exactly how long-standing, chronic neck pain could have shoulder and upper back origins, particularly from the trapezius and levator scapulae muscles. We discussed some fundamental musculoskeletal dysfunctions at the root of neck and shoulder pain—subluxations, muscle tightness (hypertonia), spasm and trigger points—and a few things you can do at home to relieve some of these issues. This article is going to get a little more specific as to how time and gravity factor into chronic neck and shoulder pain, primarily as it relates to posture. I will also outline and demonstrate through video what you can do, again, on your own at home, with exercises to strengthen, stabilize, and correct your upper back and shoulder dysfunction. In the end, you will understand how chronic neck pain develops and how you can prevent it from becoming that nagging problem that keeps you up, and hurting, at night. Last article I discussed one form of muscular dysfunction that can cause neck and upper back pain—muscle spasms. Muscle spasms result from muscle fibers “forgetting” to relax. They somehow lose touch with the neurological signal that tells them to release. A less extreme form of constant contraction is called hypertonicity—hyper meaning “a lot,” and tonic meaning “tone,” so muscles with a lot of tone or contraction. Hypertonic muscles are tight, contracted muscles that are not yet quite spasmed. Most people with chronic, but low-level, neck and upper back discomfort are likely (at least in part) experiencing this condition—they often described it as “stiffness” or “tightness,” and the sufferer feels as if they want to, but can’t quite, stretch the discomfort out. The most common components of hypertonicity, as they relate to the neck and upper back, are our old friends the upper trapezius and levator scapulae. As I described last month, these two muscles are shoulder elevators; when they get hypertonic and tight, these muscles cause a shrugged posture. Another group of muscles can also get tight causing a hunched-forward posture—we call this a flexure posture, and the muscles responsible are primarily the pectoralisgroup (pecs for short) and the scalenes. Both these groups are in the front of the body, the pecs being the chest muscles and the scalenes residing on the front of the neck. Tight pecs round the shoulders, while tight scalenes jut the chin forward—sort of Quasimodo-like, I always say. Tight pecs can result from lots of bench pressing, or pushup, with very little stretching thrown in—a faulty combo. They also get tight as result of gravity. That’s right, doing nothing can lead to tight pecs, too; albeit more slowly. Tight traps, levator scaps, pecs and scalenes can all cause neck and shoulder pain on their own, simply by feeling tight, stiff and developing trigger points. But an interesting thing can happen when these muscles are tight as a group, together; they can actually lead to compression of the subacromial space, leading to impingement, as well as compress the nerves going into the arms (brachial plexus) leading to numbness and tingling of the arms and hands. If you remember my article on shoulder impingement, well…it ain’t fun. Basically, shoulder impingement syndrome is when the sub-acromial elements—the supraspinatus and biceps tendon, and the bursa—get pinched and inflamed. You can see how this example of neck and shoulder pain can occur together. The unfortunate thing is that this scenario is often overlooked by non-orthopedic medical doctors. It either gets diagnosed as a “tendnitis” or even a disk herniation. No doubt a disk herniation could have similar symptoms, but I believe these diagnoses are way overused; not with bad intentions, mind you—I just think that too many doctors forget that people can have multiple problems happening at the same time. Further, the emphasis on systems and symptoms over function and biomechanics is foolish in musculoskeletal health. Another muscle that can contribute to neck and shoulder pain is the biceps. Now we know the biceps tendon passes through the sub-acromial space to attach to the scapula, thus it’s connection to shoulder pain. What many do not consider is that a chronically tight biceps will pull on the scapula, or shoulder blade, forcing opposing muscles to counter. As a tight biceps pulls the shoulder blade down, the muscles of the neck—upper traps, levator, scaps and scalenes—will resist, causing tightness, hypertonicity, and even spasm. Once again, we cannot separate the neck and shoulders. Chronic tightness in one region will most certainly lead to dysfunction in the other. Therefore, if you are being treated for either malady alone—neck pain or a shoulder condition—and the doctor is not concurrently addressing, or at least examining, the other region, then you’d better get used to your problem because it is probably hasn’t fully gone away, or it keeps coming back over and over again. Muscular imbalances occur when one group of muscles gets very tight, while another group, usually the agonist muscles (doing the opposite actions) gets weak, or a better way to put it, gets lazy. In a neck/shoulder dysfunction scenario, the muscles that get weak are the lower trapezius, serratus anterior and the muscles of the rotator cuff. The lower trapezius is a scapular stabilizer—that is, it holds the shoulder blade down as we do overhead arm movements. What happens in theupper trap heavy person that we described last month is that they have no effective counter against the tight, shrugging upper traps/levator scaps. So it’s like a double whammy—tightness and no opposition—very disruptive to proper biomechanical functioning. This means that every arm movement is leading to further shoulder breakdown, and further tightening of the neck. Every decade you add to this scenario increases the pain and breakdown substantially. Yes, I see people in their 60-70s that can’t fathom why they would have a shoulder problem. I hope this explains how it happens. Another very common imbalance is the flexure posture I described above. Tight pecs, tight scalenes and weak serratus anterior are the coupled players. Throw in weak lower traps and, forget about it, that is chronic neck and shoulder problems just begging to happen. 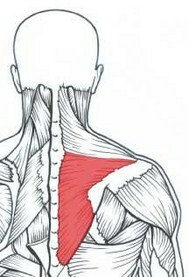 Tight pecs roll the shoulders forward, compressing the sub-acromial space, as well as compromising the brachial plexus. The scalenes pull the collar bone up, further diminishing the sub-acromial space, and compromising the tendons and bursa there. Tight scalenes are also a major culprit of clipping off the brachial plexus, leading to numbness and tingling in the arms and hands. Now, it should be said that a weak serratus anterior muscle is not necessary for a flexure posture to occur. Plenty of people—mostly men, but women too—have tight pecs from working out heavily and not stretching. Look around, you’ll see them—people with super-tight pecs and a hunched forward posture—weight lifting as a form of exercise has increased this postural aberration. I want to take the time to discuss a common cause of both chronically tight scalenes and numbness/tingling in the arms and hands. Some rear-end auto collisions happen with sufficient force to cause the head to jerk in opposing directions. This head movement can be strong enough to tear the sensitive muscles tissue—primarily the less resilient scalenes—at the front of the neck. We call this injury whiplash. Now whiplash can have elements of spinal injury (subluxations), as well as neurological insult; but the main element I see causing problems five, ten, sometimes 20+ years later, are previously-torn, fibrosed scalene muscles. Un- or insufficiently treated scalenes will certainly get tight, but add some scar tissue and the muscle will be prevented from lengthening with simple stretching alone. When fibrosis sets in, any stretch (including simple day to day head movements) runs the risk tearing healthy muscle surrounding the scar tissue. These microtears heal with the help of the body depositing more scar tissue, setting into place a vicious cycle that ultimately leads to forward drawn head posture, nerve compression and neck pain. 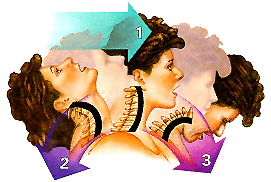 Whiplash is a frequent source of chronic neck pain and disability. So many people coming into my Los Angeles chiropractic clinic suffer neck problems resulting from untreated whiplash injuries. It’s a shame that this injury is still being missed or neglected by doctors; or perhaps, they are not taking the time to explain the consequences to their clients; but also it is possible that some people just ignore the warnings, thinking that it won’t happen to them. Those odds, I assure you, are not worth taking. If you have been in a motor vehicle accident, then get checked by a chiropractor—don’t let something fixable haunt you for more time than necessary. And make note, all injuries become harder to treat as the years pass, so be wise. What do you get when you’ve had a previous acceleration/deceleration accident, have developed muscular imbalances AND spend lots of time in front of a computer? A very sore neck, most likely. This is the profile of the average chronic neck pain sufferer coming into my Beverly Hills chiropractic clinic. So we’ve discussed the long-term consequences of unresolved whiplash, and we’ve discussed muscular imbalances of the neck and upper back in detail, but what about posture? Gravity impacts us all—shaping and forming our bodies in response to gravity’s influence, unless we exert energy to counter nature’s effects. In physics, there is a principle known as the second law of thermodynamics. This law describes entropy, the tendency to move toward disorganization. A simple example is the of dropping a sugar cube into a glass of water—the sugar will dissolve. Unlikely that liquid sugar will crystallize into a sugar cube unless heat (energy) is applied. That is entropy—the universe moves toward chaos, breakdown, and deterioration; and we humans are not immune to gravity’s entropic force. Gravity works musculoskeletally by shortening muscle fibers, degenerating joint surfaces and wearing away bone. Thermodynamically, these changes lead to lower energy states. We can counter these effects by continuously adding energy to the system, in this case, the musculoskeletal system. Energy is provided in the form of exercise and stretching, which we must do to maintain a less degenerated condition (we all degenerate, no matter what, but we can affect the rates of degeneration significantly by our actions). Here’s the connection to posture: When we sit in front of a computer, books, drafting plans, or whatever forces us to hunch forward continuously, we go into—and perpetuate—a physical state requiring low energy to sustain. The body, over time, will adapt to this state, shortening muscles, ligaments and fascia in response to saving energy. It’s efficient, but entropy increases and breakdown/deterioration speeds up—this leads to a hunched forward posture and the spine also molds to accommodate the other tissue changes. 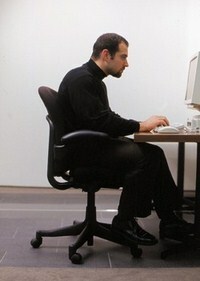 I call this posture: computer neck syndrome. Obviously, this gravity-induced posture will lead to pain, muscular imbalances and increased deterioration, but we can correct and prevent it from permanently setting in. We do this through chiropractic, functional rehab and postural retraining. Fancy words aside, in my West Hollywood chiropractic clinic we return normal spinal motion, correct muscle imbalances and train our clients to maintain perfect posture. Let’s see how. Computer neck can resolved by addressing three essential components—subluxations, muscle imbalances and posture. Subluxations are corrected with chiropractic adjustments. Adjustments open the spinal joints, restoring motion. In computer neck, we are, once again, focusing on the cervical and thoracic spine (neck and upper back). Hunching forward causes the upper and mid-back to round, and the head to draw forward. As a result, spinal joints subluxate, so chronic neck pain due to computer neck needs adjusting. Muscular imbalances are addressed in two ways. Short, tight muscles need to be relaxed [with post-isometric relaxation (PIR)], while weak muscles need strengthening. Simple. The trick is in identifying which muscles need what, and which ones need to be left alone. That’s the doctors job, but you can probably bet that the pecs, biceps and neck/upper back muscles will need stretching, while the lower trapezius, serratus anterior and deep neck flexors will likely need strengthening. Posturally, the adept chiropractor (or physical therapist) will help the client retrain the postural muscles. In this regard, I am talking paraspinals, but I also mean stabilizer muscles like the lower traps, serratus anterior and the deep spinal muscles. Some chiropractors will throw in some neurological re-patterning exercises—like cross-crawls—or even proprioceptive training (balance). I do in my Los Angeles, Beverly Hills and West Hollywood sports chiropractic clinic because I know how powerful these two activities are to restructuring posture. If a foot dysfunction (overpronation, specifically) is also present, I recommend using custom made orthotics to return the arch lost by many overpronators. This simple step adds height and improves posture by overcoming the tendency to hunch forward, as so many overpronators are wont to do. Finally, if there has been a previous auto accident with underlying fibrosis of the scalene muscles, myofascial work will be required to break up the adhesions and scar tissue, and bring length back to those injured muscles. That’s it! That is computer neck syndrome in its entirety. I’ve attempted to describe a few ways in which the neck and shoulder girdle are tied together to make neck pain, upper back pain and/or shoulder pain co-contributors to chronic upper body disability. The most important walk-away lesson here is that when one or more of these regions is neglected, your pain won’t go away. Some people take this as a sign that 1) they are getting older, and 2) they’ll just have to live with it. Neither of these notions is true. Not only is chronic pain NOT normal, but all musculoskeletal problems have solutions. Any doctor that tells you otherwise doesn’t understand the human body, or they just aren’t looking at the entire picture. Don’t give up, keep looking for a doctor that will investigate all associated areas and get your body functioning the way it is meant to—pain free and fluid. Visit a sports chiropractor today.